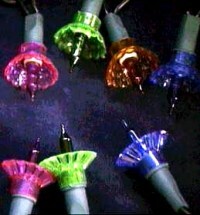 The 90s saw the demise of shaded lights. Real Christmas trees made their comeback and as the trees went back to basics so did Christmas lights. 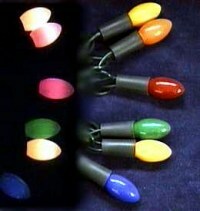 In 1990 most, if not all, light sets where coloured with shades. A few years later saw the appearance of 'white' shadeless sets. I distinctly remember looking for a set of clear lights in the early 90s and being unable to obtain any as they had sold out. One point to note is that the safety regulations where changed in 1990 which meant that all mains voltage light sets had to have double insulated cable. Double insulated cable is easy to identify as it is much thicker that any cable previously used for Christmas light sets. Unsurprisingly this is a set of illuminated drums. Each drum has gold cord running between the top and bottom of the drum and can be fitted to the lamp holder either way up… nice one Noma! 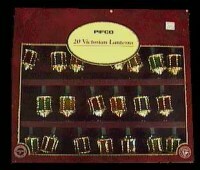 The drums are opaque so produce a gently glow when illuminated. These sets where available in multicolour or red. The set I have is an example of the multicolour variety and was bought ex-demo. A pretty set with 20 delicate, refractive, coloured belles. These sets look great strung round a room and are light enough to be put on the Christmas tree to add a little sparkle. There's not much that can be said about these lights, the picture virtually says it all. It's a shame that Pifco put clear lamps into each lantern as this has a tendency to washout much of the colour. Apart from that one point this is a very nice set. 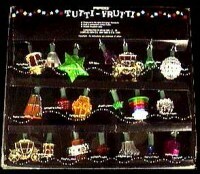 Pifco's Tutti-frutti is the only set I know of that is made from 19 different sets! This is an obscure combination of shades that can best be described as something for everyone. Sadly Pifco no longer produce many of these shades but there are a few still in production. I suspect these sets where produced to use up a stock of shades. Pickwick sets can only be described as a classic design. The shades are coloured and 'dish' shaped with little refractive bumps on them which gives them a little bit of a sparkle. These sets will last many years if looked after properly and have a relatively low selling price so are good value for money. At one stage, Noma where producing two different styles of Pickwick shade. Both types are shown on the left. This set mimics the old large bulb sets from many years ago. The set has 12 lamps, each with a coloured opal finish which gives your tree a traditional warm, cozy glow. Somehow these lights don't quite replace the old sets but are much safer and more reliable. Unfortunately the Nostalgia sets are no-longer available. Noma's "Classic" light sets are probably the best quality fairy lights money can buy. Many of the "value" light sets available in DIY stores are poorly constructed thus will only last a couple of years. "Classic" light sets are a little more expensive, due to the solid construction, but will last many years and you will not have problems obtaining new bulbs either. Both Noma and Pifco have excellent customer services departments which can supply replacement lamps if you can't obtain them locally. "Classic" light sets are available in a range of lengths from 20 lamps to a massive 210 lamp set which should cater for most applications from a small window to a large Christmas tree. 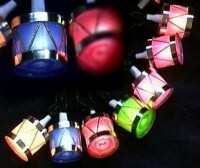 The lamps don't have shades and are available in clear, multi or single colours with green, white or silver lamp holders. To create a classy looking Christmas tree you can't go far wrong with a set of clear lights such as these. If your tree happens to be white, you might want to try a set with white wire. The "Classic Twinkling" sets are somewhat unusual as every other lamp is a random twinkling lamp. 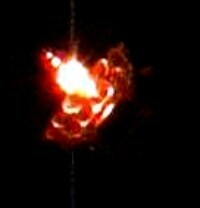 The twinkling lamps ore not ordinary flashing lamps as, when the lamp is hot and filament extinguished, the lamp bypasses itself. The result is that the other lamps remain lit but slightly brighter than before. As half the lamps in the set are twinkling ones, the remaining lamps randomly vary in brightness. The overall effect is a pleasant twinkling/shimmering effect, which can become quite distracting over long periods. Outdoor Christmas Lights had been around for some years but it was not until the 90s that it became popular to illuminate the outside of houses. Previously outdoor light sets had only really been used in high streets and other public places. Noma where producing 40 "Great outdoor" light sets and the shorter "Twenty Outdoor" sets. These sets use bright 3 or 2.3 watt lamps so, unlike many of the miniature low voltage sets, can compete against the ambient light on well lit streets. Recently the "Twenty Outdoor" light set became known as "Winter Palace". The "Carnival"/"Silent Night" 100 light low voltage sets are massive. The sets are about 100ft long and have 100 bright 120mA lamps. Ok they aren't as bright as mains sets but if you need a long outdoor set and have a tight budget, you can't go far wrong with a set of these. 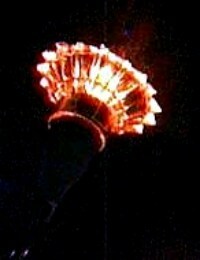 In 1996 I bought a set of "Carnival" 100 which has been used and admired every year. The small lamps look like small stars when lit and almost disappear during the day. By 1998 Noma had changed the name of these sets to "Silent Night Miniature" and redesigned the box. Fortunately these sets are appearing on the shelves ready for Christmas 2000.